Copper alloy coin weight. 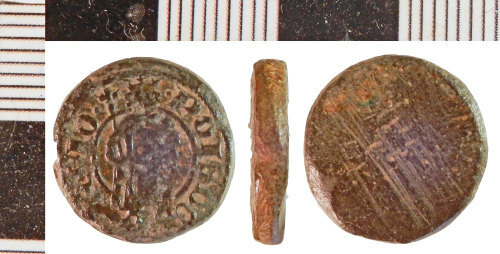 Cast discoid weight with the stamped image of a seated king with crown and sceptre. A circumferential legend reads: POIS D'O R IO. Withers and Withers (2011, page 29) ascribe this, or similar variant weights, to equal the mass of a double royal of Philippe VI of France (1293-1350). A circular copper alloy weight for the parisis or double royal gold coins of Philippe VI of France.